People ask me, “Chris, why do you start off so many posts with the ‘People ask me’ gimmick?” To which I respond, “Do I use it that often? I don’t know, you try and write something original every day.” People then always follow up with, “Why are you getting hostile?” To which I say, “I’m not hostile! Just tired of being asked so many questions.” This then leads people to ask, “This isn’t even a real conversation — so, are you just hostile and tired of yourself?” After this I usually finish brushing my teeth and start my day. Here are five beers to know this week. Send in your own beers for possible inclusion to [email protected]. Just don’t question what happens next. Elevation Beer Co.’s award-winning Horchata Imperial Porter, Señorita, returns for its second year in 12-oz cans, now available in six-packs and on draft across the brewery’s distribution footprint as a seasonal release through colder months. Available just in time for Día de los Muertos and as these cooler autumn months call for big, rich, flavorful beers, this horchata imperial porter delivers aromas of vanilla, cinnamon and sweet milk to stir up images of the delicious Mexican drink of this beer’s namesake. When looking at the valley that passes through dramatic mountain ranges, the Ute likely called it “poo-paca” (meaning footpath), a word that early Spanish explorers likely misheard as “Poncha.” To Elevation, Poncha Springs has become the footpath for their lives, and Elevation brews Señorita as a tribute to the traditional Spanish drink they love to sip looking out at Poncha Pass, pondering the history of this great place. Señorita pours an off-white head with a deep dark brown body and is carefully balanced with hop bitterness from the inclusion of Northern Brewer and Chinook Hops. Sweet chocolate malts and hints of cinnamon spice compliment 8.4 percent ABV and 25 IBU of this Imperial Porter. Long time collaboration pals Dogfish Head and Woolrich went deep into the woods to bring back Pennsylvania Tuxedo; a pale ale brewed with Pennsylvania spruce tips. They are also releasing a new limited-edition camo hat. Shipping late September, Pennsylvania Tuxedo (8.5 percent ABV) has a grassy, citrus kick with resinous conifer notes, balanced by a dry, yet doughy malt backbone. Every year since the first beer launched in 2014, friends, family and employees of Woolrich come together to harvest new growth spruce tips for Pennsylvania Tuxedo, hand-picked from the forests outside their factory in central Pennsylvania — a family reunion of sorts. The two companies are also releasing a special Dogfish Head x Woolrich camo hat. Priced at $25, the design of the collaboration hat was thoughtfully focused on two style trends that have been the cornerstone of the menswear industry for decades — camo and workwear. The selected colors and patterns have a uniquely modern look resulting in a rustic, abstract pattern that bridges the aesthetics. 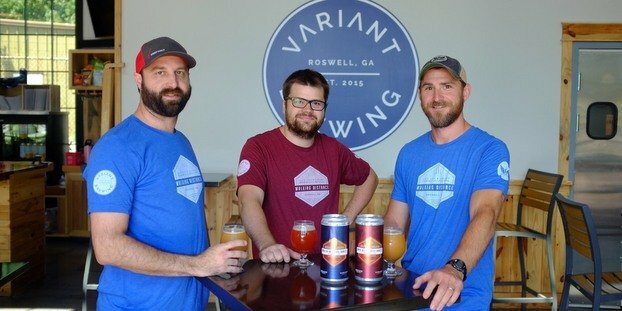 Squatters Craft Beers, in partnership with the American Cancer Society’s (ACS) Real Men Wear Pink campaign, is raising funds and awareness for the second year in a row to benefit breast cancer research during October, National Breast Cancer Awareness Month. Squatters’ number one selling brand — Hop Rising Double IPA — will wear a pink can for the entire month of October. Squatters Craft Beers has pledged to donate $0.05 for each special can sold during the campaign. New in 2018, Squatters will double down and donate a portion of proceeds from special pink-canned Full Suspension Pale Ale 12-packs. “We are excited to include an additional Squatters package this year to support the American Cancer Society and generate much-needed funds to combat this devastating disease,” said Senior Marketing Manager for Squatters Craft Beers, Amy Tangaro. Alongside or in memory of the women in their lives who have been touched by cancer, Real Men Wear Pink advocates will rally to raise funds and awareness during the month of October. Activists are encouraged to don their pinkest gear, mobilize their communities and compete to become the top fundraiser in support of lifesaving research and patient-supporting services. pFriem Family Brewers was named Mid-Sized Brewing Company of the Year and was awarded a Gold Medal for Druif in the Mixed-Culture Brett category and Silver for its Pilsner in the German Style Pilsener category. Based in Hood River, Oregon, the six-year old brewery is best known for artisanal beers influenced by the great brewers of Belgium while staying true to homegrown roots in the Pacific Northwest. Gold Medal-winning Druif incorporates Riesling grapes from Brooks Estate Vineyard with pFriem’s Lambic-inspired base. This produces a beer with inviting aromas of fresh bread and berries. Its notes of delicate rose petals, pear and green apple complement a dry, sparkly finish. Silver Medal-winning Pilsner brings forth an aroma of fresh grass and flowers and a touch of honey. It has a crisp, snappy flavor featuring floral hops, with 4.9 percent ABV and an IBU of 35. After receiving more than 600 name submissions, Conner Prairie and Sun King Brewing Co. announce “Ichabrewed Crane” as the official name of the Headless Horseman Festival brew. The list of more than 600 name submissions was narrowed to three finalists: Ichabrewed Crane, Conner Scarey and Knock It Off. The contest winner received a four-pack of tickets to Headless Horseman, a $50 Sun King Brewery gift certificate and a commemorative Headless Horseman growler. The copper ale will be available from 5-8 p.m. on Wednesday, Oct. 10, at a tapping party at Sun King’s small-batch brewery and taproom in Fishers. All ages are invited to attend this free event where Conner Prairie interpreters will be on hand to help celebrate this launch and join in family friendly activities including pumpkin decorating. Fans of Conner Prairie and Sun King will be able to purchase for a limited time, commemorative growlers showcasing the art for “Ichabrewed Crane.” Growlers can be purchased inside The Conner Prairie Store and at Sun King’s Fishers tap room for $20. Headless Horseman, the annual Halloween festival, is open from 6-9 p.m. on Oct. 11-14, 18-21 and 25-28. Isn’t an Imperial Porter a stout?